Yay... it feels so great to be sharing a sewing tutorial after a few weeks of knit and crochet! This tutorial first appeared on the fun home dec blog-- What's Ur Home Story! If you haven't visited-- I recommend checking it out! When Vidya What's Ur Home Story from asked me to share an easy beginner sewing home dec project I was a bit stumped-- I normally recommend skirts as first sewing projects. But then this magic pillowcase popped into my head. This pillowcase is such a simple and satisfying project to make-- I might just change my recommendation for beginners! This pillowcase is sized to fit a standard pillow. This is a simple project with only straight line sewing. 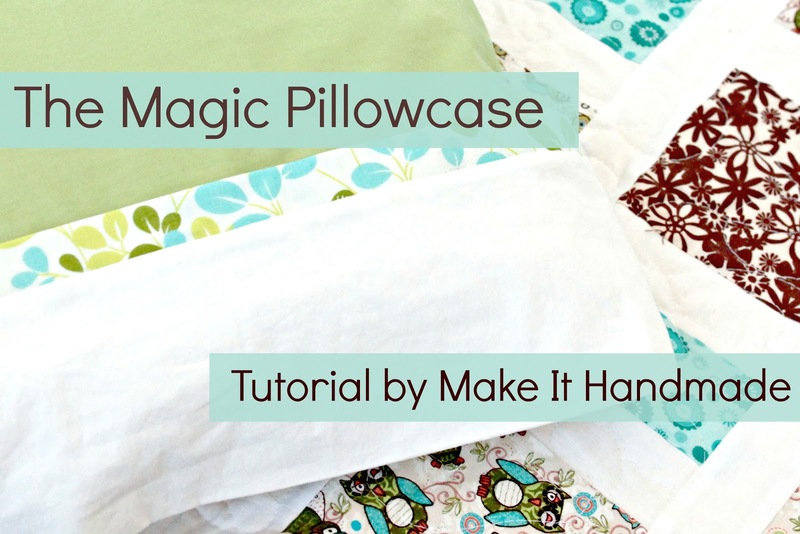 If you know how to thread your machine, you'll be able to make this pillow. In fact-- the hardest part of this project is the pinning and ironing. I'll give tips along the way for what to do if you make a mistake. I'm using fabric and a sheet leftover from a quilt I'm making. Once I'm finished, I'll have a matching set that is completely unique and handmade at no extra cost! I recommend using quilting cotton and avoiding any slippery fabrics if you are a beginner. Another frugal option is to use a portion of a 'flat sheet' from any big box store for the body of the pillow, which is what I did here. You should easily be able to get two pillowcases (and perhaps even a curtain) from a flat sheet that will match your bedding perfectly. Note: You'll notice that I cut my cuff and accent piece slightly larger than my pillow body to better show how to layer the fabric. All of your fabric layers will be the same length (45"). Tada! Once you've pulled your pillowcase out, you'll see that all the seams for the accent, cuff and pillowcase body are magically hidden inside the cuff. Iron your pillow, taking care to make sure the cuff is flat and even. If the side and bottom seams don't match up perfectly, you can give them a small trim at this point. Turn the pillowcase inside out and iron the bottom and side seams very well. Move your needle over to the left and sew with a large seam allowance (5/8 of an inch or larger) down the bottom and side seams again. This will 'trap' the raw edges between the two seams. Now your pillowcase is ready to use and enjoy! For bonus points, send me a picture-- I'd love to see it! Here's mine on the matching quilt. I'm going to start doing more home dec sewing. It's wonderful to make something I know is going to fit and will be enjoyed by my family for years to come. This is super easy!! I made three of them this afternoon for the kiddos and they can't wait to sleep on them tonight!! Thanks! !